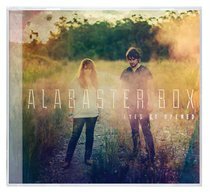 Much-loved Australian band Alabaster Box return with 11 all-new rockin' tunes that will leave you wanting more. Featuring catchy melodies, sharp songcraft, and Naarah's powerhouse vocals, Eyes Be Opened takes listeners on a musical journey of hope and encouragement. In 2000, Alabaster Box gave up the security of full-time jobs to minister through music across Australia and New Zealand. Over the next several years, the band recorded seven #1 Australian Christian Radio hits and saw thousands receive Jesus. They've shared the stage with Michael W. Smith, Rebecca St. James and many others. "This generation needs to know of a Savior's love, and I know that we have a key role to play in that. The calling on our lives is what writes the songs and drives the bus", says Naarah.